Dr. Laria is the founder of Laria Eye Care. Originally from Cuba, she pursued her Bachelor’s degree in Biology at the University of Miami in the year 2000. Dr. Laria then attended State University of New York where she obtained her Doctor of Optometry Degree in the year 2004. Both a National and Florida Board Certified Optometrist that is licensed to prescribe therapeutic medications. 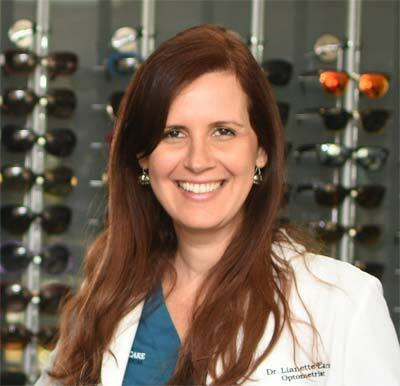 Dr. Laria practices primary care Optometry, which emphasizes in a patients’ best visual acuity and visual comfort with glasses or contacts which her patients usually describe as “the best pair of eyeglasses I have ever had”. This is because Dr. Laria is involved not only on the refractive portion of the prescription, but she helps you along in the selection of frames, special measurements according to your needs, be it in the office or for pleasure and sports and recommendations for best type of lens to use. Dr. Laria provides comprehensive eye examinations, which means that all of her patients receive a complete eye health assessment including eye pressure, check up of the optic nerve and the retina and screening for eye diseases. If needed, she provides referral to the appropriate eye care specialist for further treatment.